difficult situations, Chris has the innate ability to put those around him at ease and bring comfort to his patients. Chris plays an invaluable role at Community Ambulance. He serves as a preceptor for local EMS students, as well as for new Community Ambulance associates. Chris readily takes those new to the industry under his wing in order to help them become the best EMS professionals they can be. In addition to his role as a full time Paramedic, Chris also serves as a volunteer firefighter for the city of Climax. Chris demonstrates incredible dedication to serving others and continually seeks opportunities to enhance his clinical skills. 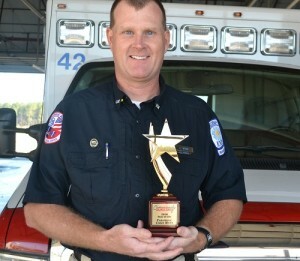 Caring, compassionate and capable, Paramedic Chris Wynn defines what it means to be a “star” in EMS. Chris and his wife, Dana, have two daughters, Miranda and Marisa. The Wynn family lives in Climax, GA.